As this exhibit and the archive from which it draws show, Horror and Crime comics in particular provided parents and other concerned adults could with many reasons to express their outrage. Intriguingly, given the seemingly limitless array of murder, criminal mayhem, sexually suggestive imagery, and undead and monstrous fiends available on the racks of local drugstores across North America, it was a story wihose sexuality and violence were not depicted explicitly but merely suggested that became the most notorious of the period. 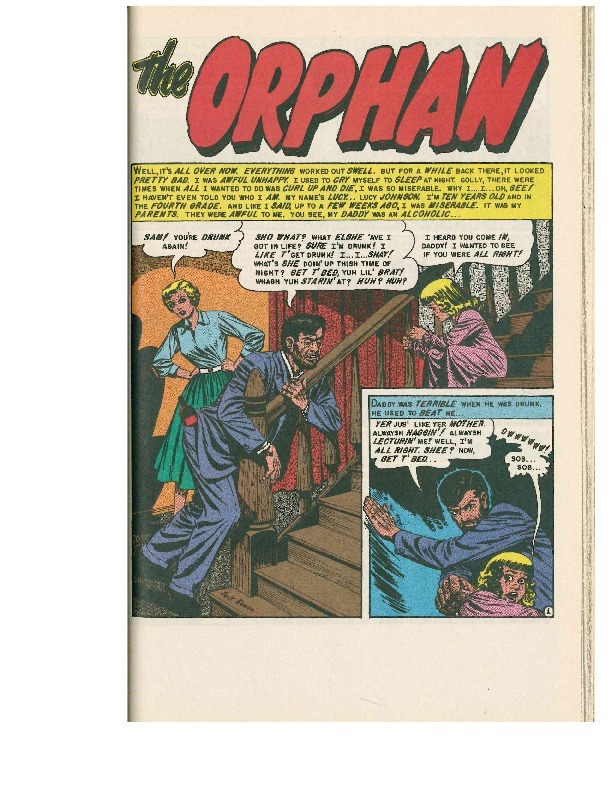 'The Orphan,' which appeared in EC's Shock SuspenStories #14, featured instead a ten-year-old girl named Lucy, whose freckles, blonde ringlets and hopeless tears evoked the standard visual tropes of victimized childhood innocence. After enduring an abusive, alcoholic father and an indifferent mother planning to abandon the family for her lover, Lucy is saved and allowed to live with a beloved aunt after her father is fatally shot and her mother along with her lover are executed for the crime. 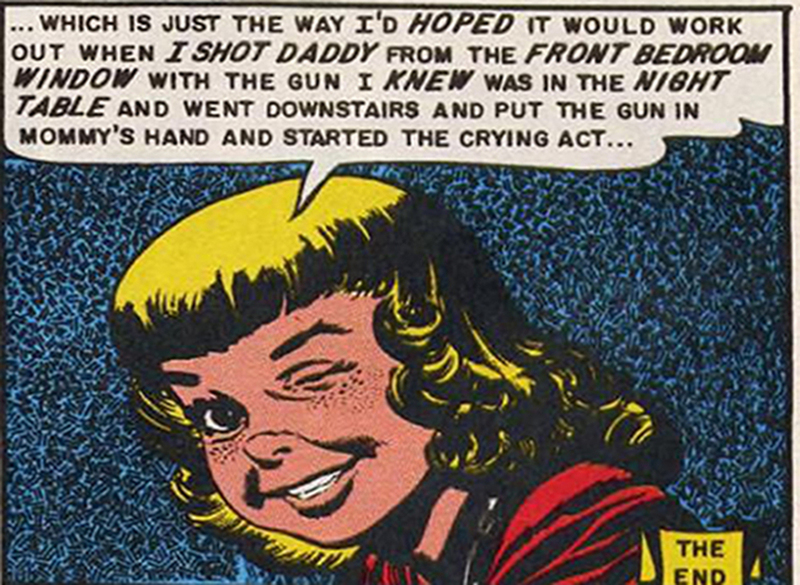 Final panel from "The Orphan"
In an ‘O Henry’-style twist ending of the sort EC regularly employed, Lucy addresses the reader directly in the final panel, revealing that she killed her own father and orchestrated her mother’s murder conviction. Her knowing wink was for many adults more disturbing than any mutilated corpse could be, as was the insinuation that her innocence was a performance; as Lucy remarks, she ‘put the gun in mommy’s hand and started the crying act.' 'The Orphan's' portrayal of a child who demonstrates both the foresight to plan out and willingness to execute a terrible crime proved the ultimate betrayal of innocence. It was this wink that made the story one of the key pieces of evidence of how detrimental comics were to be offered in the Senate Subcommittee Hearings (see section 9.1).